After our long drive and a good sleep, here’s what we came to the Flinders Ranges to do. 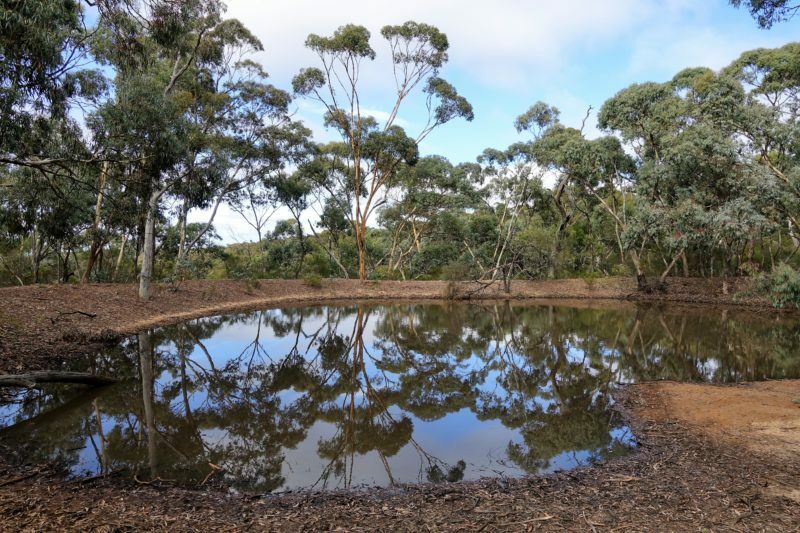 We want to get out amongst the nature, and enjoy the surrounds, so bushwalking it is! 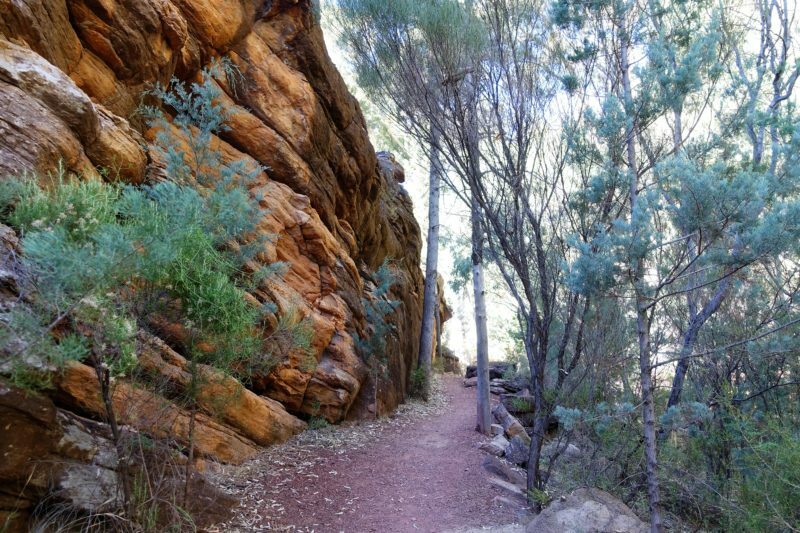 There are many great walks around Wilpena Pound. 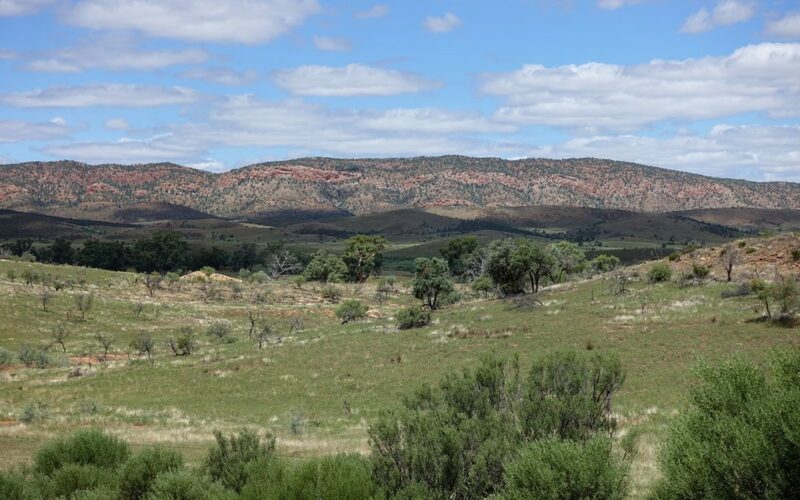 When researching them, the best place to go is to the website for the Ikara-Flinders Ranges National Park. Here you will find all sorts of information related to the national park including facilities and safety information. It gives details of the walks and maps, and this is also where you will find details of any closures which may affect your plans. It is important to check regularly before your visit. I had look at the website a few weeks ago and noticed that over the summer quite a few of the longer walks were closed, including the St Mary’s Peak track. I had wanted to tackle this at some stage, but this trip was not to be it. This, and the closure of other long walks is understandable. The temperatures in this area can get well into the high forties (Celsius) and the terrain is remote and rugged. If there is trouble, it can easily be hours before help arrives. After checking well in advance, I didn’t look again until the night before we got there when I went online to pay the National Park entry fee ($10AUD per car). Flashing before me was an announcement noting the closure of the park for the first day of our two day visit. This is what lead to the long road trip to get here. It is important to reiterate how vital it is to read all of the information regarding safety on the national park website. I grew up in a remote country area but I still felt the harshness of this environment. There is little to no phone coverage in this area, so it’s not as simple as calling someone for help if you get into trouble. Every year we hear on the news of people becoming lost, occasionally paying the ultimate price for their lack of knowledge or preparation. I chose this walk because I was looking for something substantial but also not too long since I now only had one day to walk and later drive back to my parents place to spend the night. It also had to start at the Wilpena Pound Resort. The Wangara Lookout Hike is 7.8km long and the hike time is three and a half hours. More than half of the walk was on a driveable track, so was really easy going. It is possible to get the shuttle bus up the 2km length of this track to knock 4km off any return walk if the distances are too much. 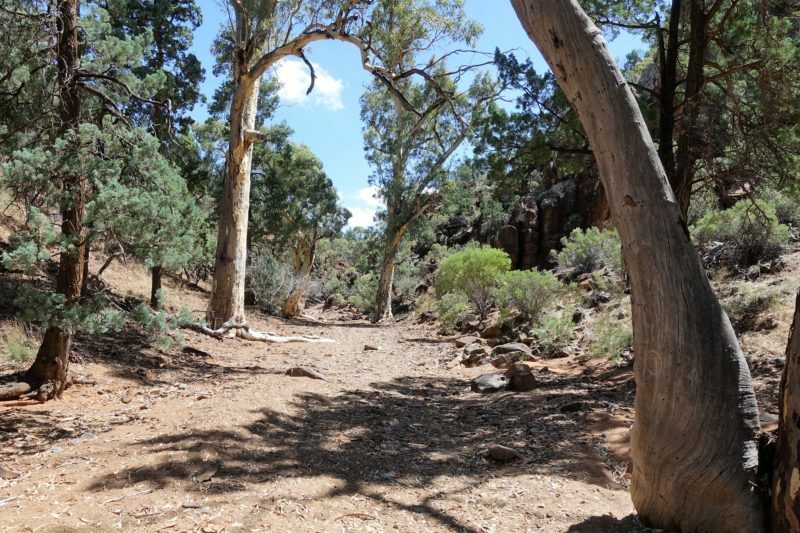 This part of the track was along the edge of the Wilpena Creek, and from time to time there were information signs giving out interesting tidbits. 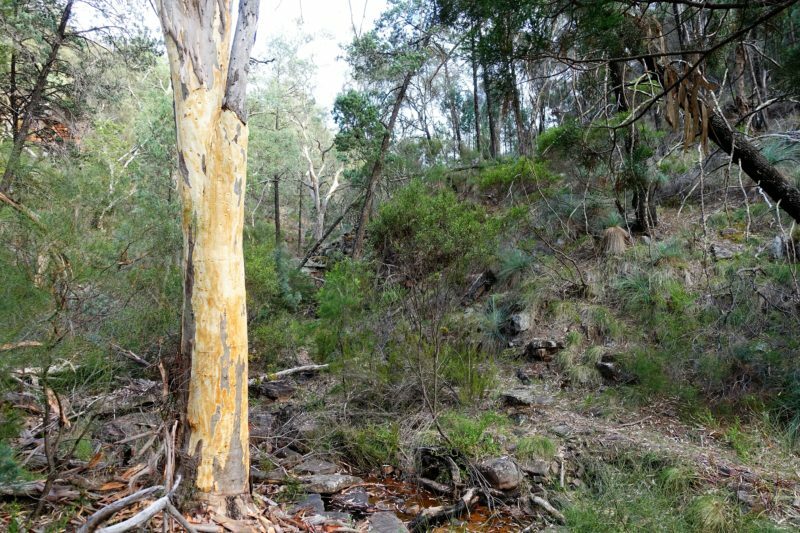 The more uncommon wildlife such as quolls or bettongs remained elusive, but we did again see both kangaroos and emus in this first section. The next section of the track was a good walking path. It was wide and clearly well used. This took us to the Hills Homestead, a tiny house that was originally home to eleven! How they all fit I will never know. 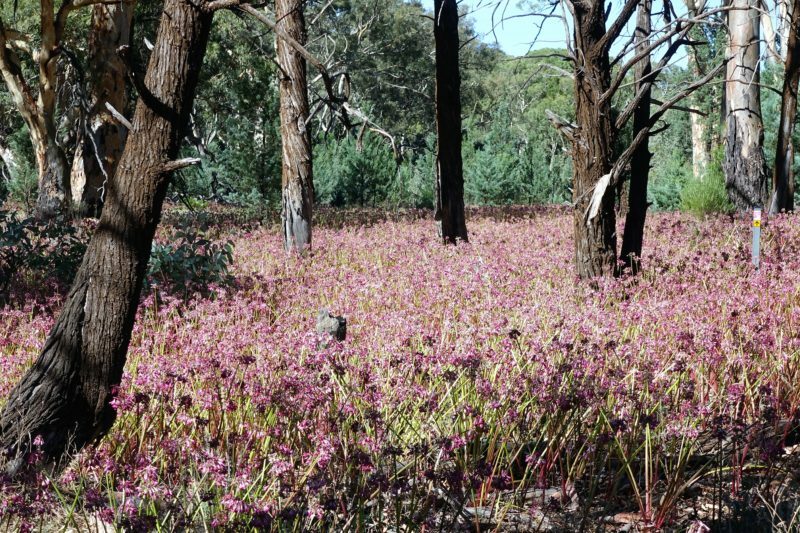 Around this area was a blanket of wildflowers, the first we had seen en masse. The second section of the walk with an easy path to walk on. Until now, the path had all been relatively flat. Heading to a lookout meant this was bound to change. And change it did, to almost straight up! The nice smooth path disappeared and we were picking out way up the rocky side of a hill. The way was still clear. After a few minutes of puffing and panting we reached the lower lookout. 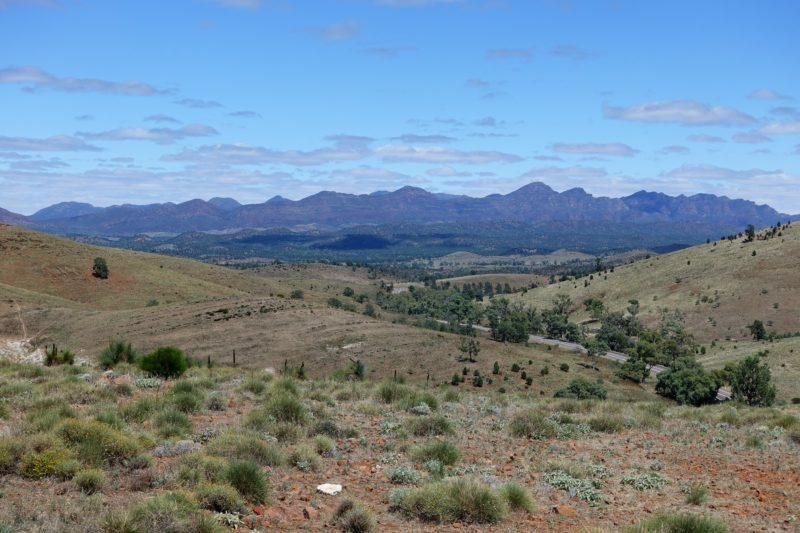 This was at 610m and gave some spectacular views over the interior of Wilpena Pound and the surrounding hills. Knowing there was yet another higher lookout, we started the climb again after only a couple of minutes rest. This last part of the climb was particularly exposed, and with the sun beating down on us we were hot and sweaty by the time we got to the top. The day was quite mild, so it would have been terrible if it was a warmer day. But we soon forgot the heat as we admired the view. The photos just do not do it justice, and I could have stood there for ages just looking. I gazed dreamily for a while, eventually turning around to see Simon and MacKenzie looking at their phones. They had just realised that up here they had phone coverage! The view was forgotten. The walk back was along the same path again. Once down on the flat path it was a relief to be out of the sun, and the easy walk back to the resort was enjoyable. The walk took us a bit under three hours, and we weren’t rushing at all. In fact in some places we stopped for photos and drinks for a few minutes at a time. If you were really committed, there is no reason this could not be walked in two and a half hours. 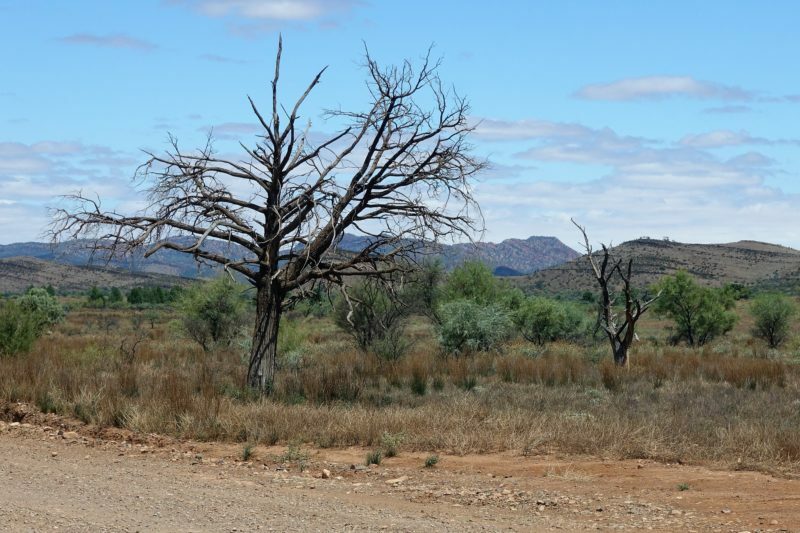 After lunch we said goodbye to Wilpena Pound Resort and went on to our next location in the Flinders Ranges. Sacred Canyon was only 20km away, but almost the whole drive was on a dirt track that would only be useable in dry weather. Along the way there were some good views over the ranges, and multiple sightings of emus and kangaroos. 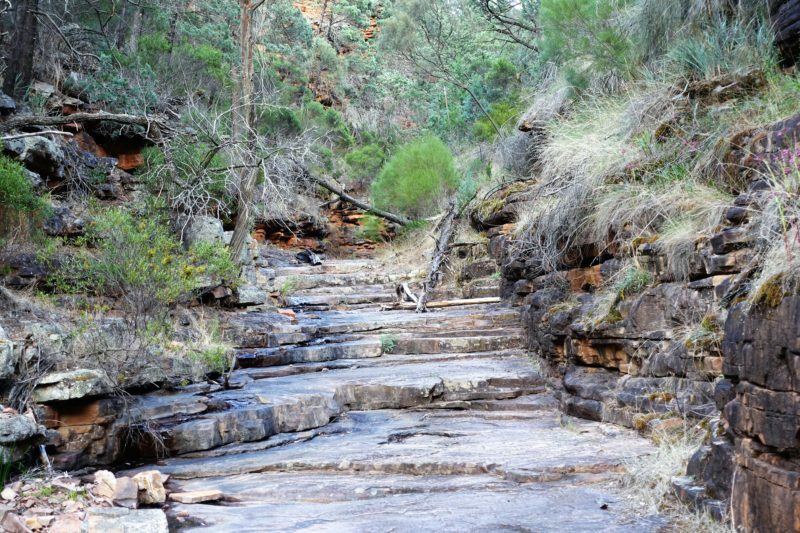 This was only a short walk from the carpark, a couple hundred metres along a dry creek bed and then about the same through rocky canyon. There were some areas where we were stepping up onto rocky ledges to continue on. The red canyon walls were impressive, looming over our heads. 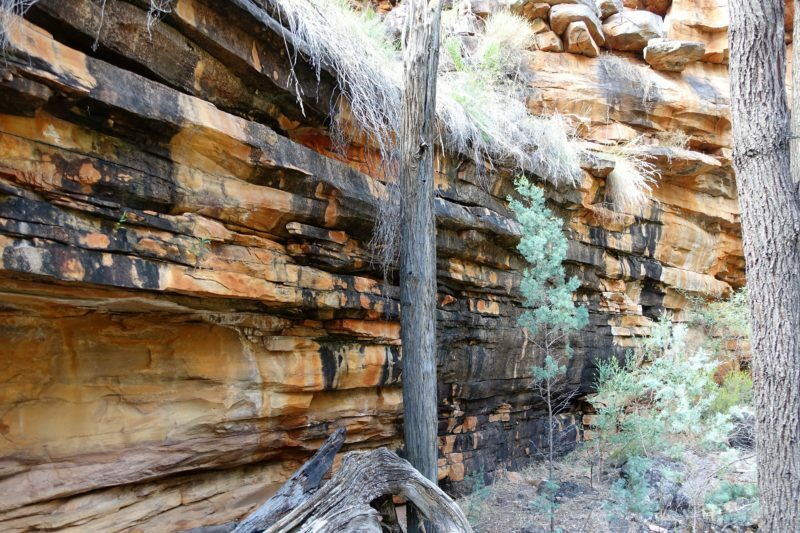 At the end of the canyon were examples of Aboriginal rock paintings. There were signs near the beginning of the walk explaining what the symbols meant. They also mentioned some of the paintings are very faint and best seen in the softer morning or evening light. Of course we were there in the middle of the day! We did see some, but I am sure there were other pieces we missed, simply because they were hard to see. In Sacred Gorge. Some of the Aboriginal rock art on the right. This walk all up took about thirty minutes, with about twenty minutes driving time each way to get there from Wilpena Pound Resort. 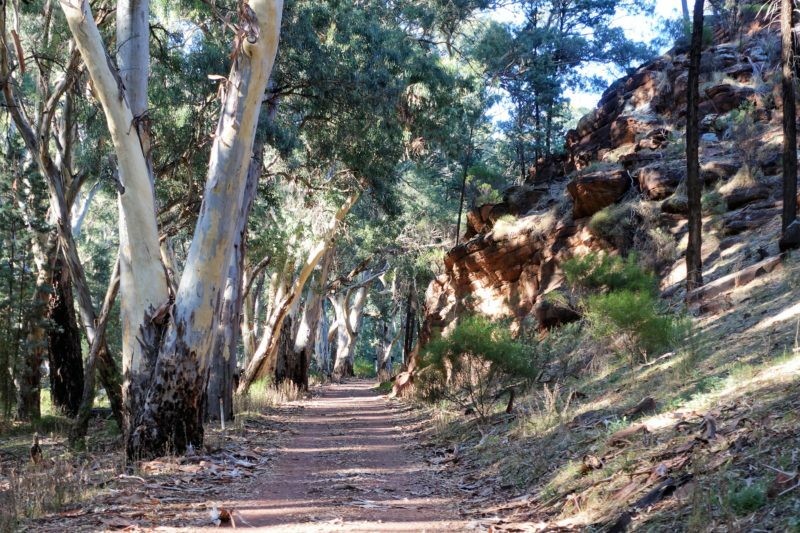 If it’s a short walk you are looking for to get a taste of the Flinders Ranges, this is for you. We left Wilpena and headed about 150km south back to my parents place for the night. 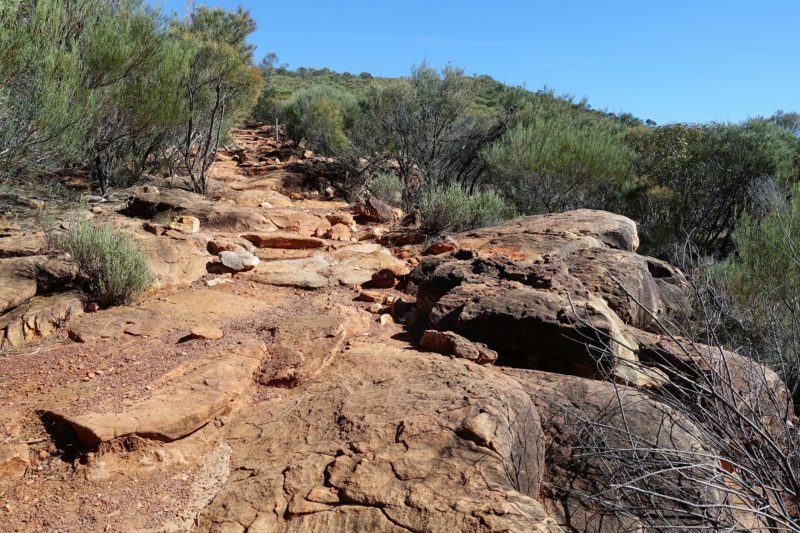 Our plan was to bush walk again the next morning in another section of the Flinders Ranges, the Mount Remarkable National Park. The national park website was again my first stop, not only to pay the park fee (again $10AUD) but to check for closures and look at the available walks and maps. We chose to do the Alligator Gorge Ring Route Hike. It was a decent length at 9km, and the start was only a few minutes from my parents house. It was to take four hours to complete. On recommendation from the national parks website I downloaded an app and an offline map they supplied of the hike because I knew there would again be no phone coverage. On arriving at the carpark we noticed the silence. There was absolutely no one else around. I was glad now I had told my parents how long we would be and when to coming looking if we didn’t return. We excitedly climbed down the steep staircase into the gorge, making a prophetic comment about how much harder these were gong to be on our return. The walk is a loop, and we chose to head to the right first. I’m not sure if there is a suggested direction, but I don’t think it would make much difference. It was soon obvious this was to be a very different walk that the previous day. The smooth path became… well, no path really! We were in a gorge, so towering walls on either side of us kept us in the right direction. We picked our way over stony sections, being careful to be sure-footed. There was no way I wanted to risk a twisted ankle or broken leg in here. There’s not really a path, we just had to make our way through this while in the gorge. After what seems like forever – but in reality was only 300m – we come to The Terraces, a section of flat slippery rocks creating an elongated staircase. We scrambled over these and back to the stony creek bottom that made up the floor of the gorge. 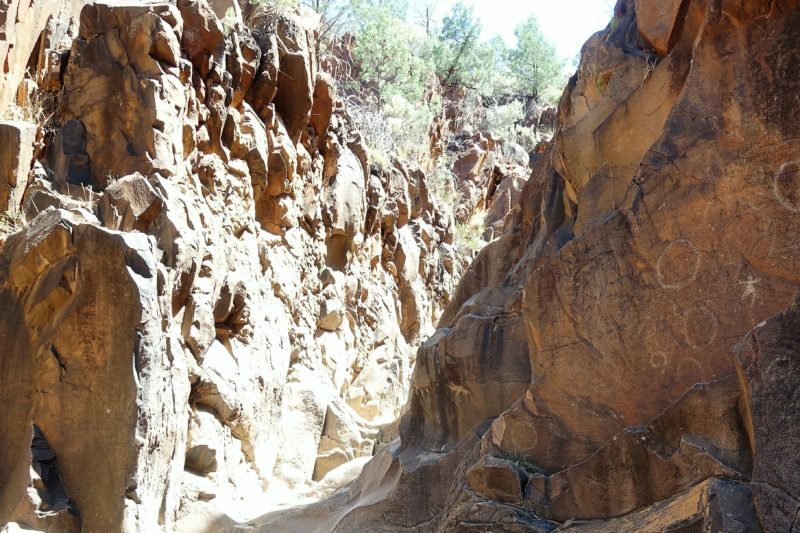 The walking is hard work, but the stunning red gorge walls make up for it. By mid morning the sun was starting to make it’s way in to light everything up. 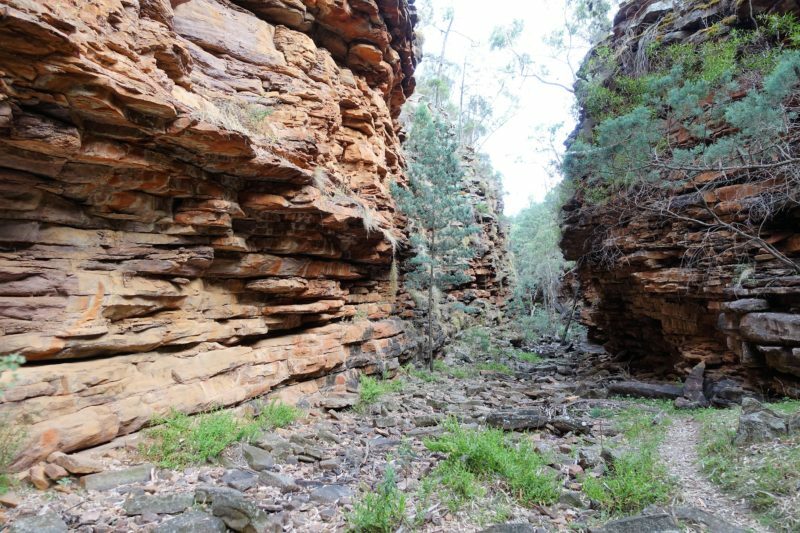 The walls of the gorge and the rocky creek bed. We spent an hour and fifteen minutes making our way along the bottom or the gorge before finding a path heading up the side. It wasn’t long before we were up the side and walking along the top edge of the gorge. The walking was now better, but it was still on a narrow path quite overgrown with bushes. Clearly there are not a whole lot of people who do this hike. I was checking the GPS to make sure we were still heading in the right direction. This path eventually comes away from the edge of the gorge. It meets up with a dirt vehicle access track. 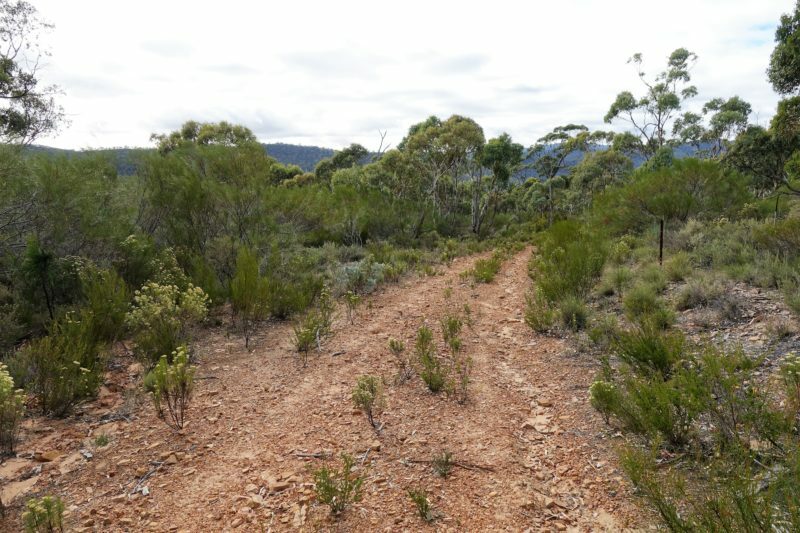 It looks like it is only use is as a fire trail in times of emergency as it was in such poor condition even 4WD vehicles would struggle to drive it. Surely no one in their right minds would drive there if they didn’t have to. The dirt vehicle track we followed outside of the gorge. We had now done 3.6km, and it had taken us 1hr45min. We had 6km to go. The next few kilometres were on the dirt track. This part of the walk was not very interesting, it was though scrub with few views or interest. We did see a few kangaroos only metres from us, but they soon bounded off. We came across Eaglehawk Dam which actually had water in it. It was so silent and serene. This track was mostly heading downhill, and I was expecting it to lead us into the other end of the gorge at ground level. Unfortunately this did not happened, and towards the end it headed uphill again, at quite a steep angle. For a brief time the track had a view. The rest of the time it was just scrub. Puffing and panting we emerge into a carpark. Unfortunately this was not our carpark! So we continue on back down another steep path into the gorge. 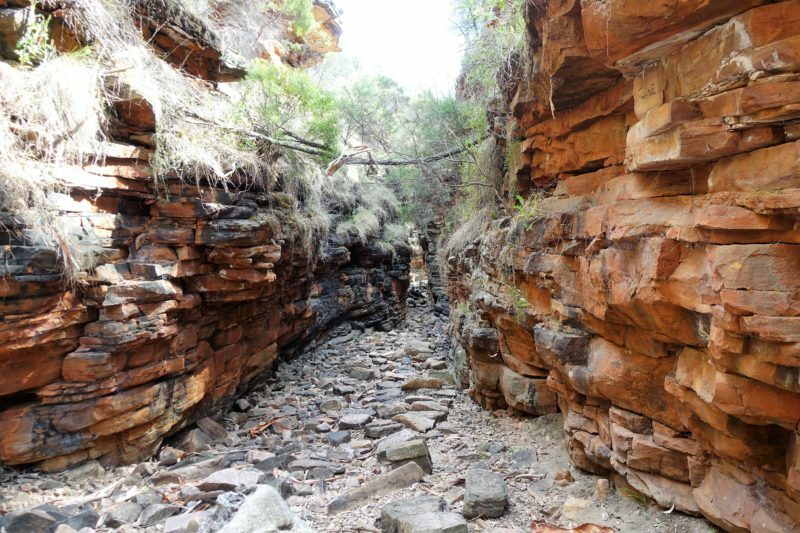 We had about 1200m to go, and it was all along the bottom of the gorge again following the rocky creek bed. About half way along, we came to The Narrows, a section of the gorge where the walls were only about two metres apart. There were an awful lot of “wow”s as we admired mother nature’s creation. The walls of the gorge were all sorts of reds and browns. The Narrows. It gets to less than two metres wide. Again the rocky creek bed to navigate. Seeing the bottom part of the stairs heading up to our car created some mixed emotions. It was hard work walking over the rocks and I was happy that it was coming to an end. I was also very aware there were still a pile of stairs to go before the walk was REALLY over. 253 steps to be precise. I counted every one of them as I slowly and steadily made my way up to the top. It had taken us three and a half hours and we still had a little time to spare before our deadline to be back to my parents place so we took the short walk (200m) out to the Ali Lookout to view the Gorge from above. The lookout was a little disappointing after being in the gorge. The views had trees blocking them and were not of the most spectacular spots. We only spent a minute or so before going back to the car. We were heading not just back to my parents, but soon after back to Adelaide. 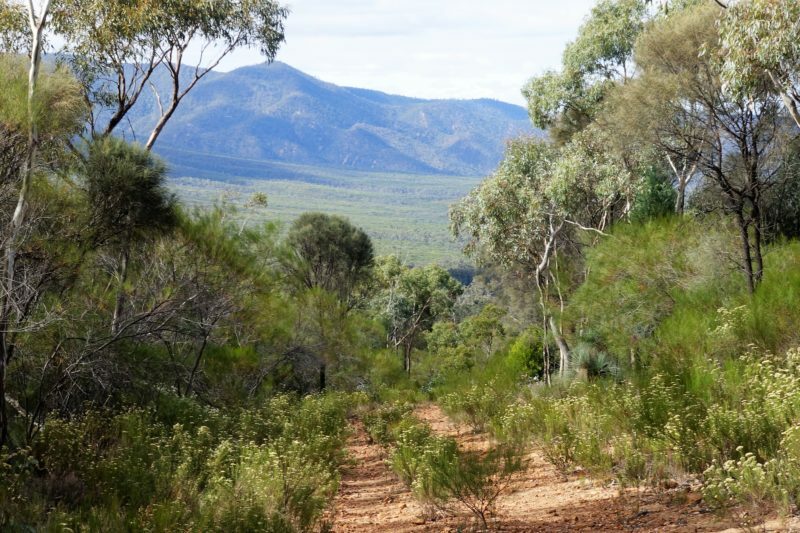 Bushwalking in the Flinders Ranges complete – for now. Great read and beautiful photos. Colours of the Gorge amazing. Think I should have visited this area 20 years ago … too much walking for me now !!! Thanks Carol! Alligator Gorge in particular is a lot of walking! But it’s not the distance, it’s the terrain that really makes it hard. A really comprehensive guide and lots of great pics! Lucky you guys seeing kangaroos and Emus! Some dramatic images there. I love the way the gorge walls are gorge-ously layered in red and ochre. Thanks for getting out in the bush. I see so many travel blogs that concentrate on hotels and airports and restaurants and stuff without getting out amongst the wildlife. South Australia has some fabulous natural resources. And some pretty good wineries and historic sites as well. You look like you are working your way through each and every one of them. If one could call it “work”. I call it work – it’s my excuse for not having one of those other paying jobs 🙂 The problem is, every time we go somewhere, I find five other places I want to go! So much to see, so little time! You’re so right – safety is incredibly important! The landscape and rock formations look amazing, I am dying to explore more of Australia. When we visit I normally go to WA or Melbourne, one of these days we will head south! Wow, what a beautiful track – completely on your own in such a surrounding. Sounds perfect to me. What I really like here and also can see from your photographic impressions is the diversity of the landscape that you see here. The Terraces look really cool. But are they manmade or naturally like this? A very informative guide and the hike looks really beautiful, through all sorts of different landscapes and nature! I’d love to see kangaroos in the wild! The sacred canyon looks amazing! Thanks a lot for all that information… I will keep this in mind for my next trip to OZ. This one is a great read! Such beautiful places are left few in the world and glad to see you got to experience this place. Nice! Sounds like an adventurous hike! 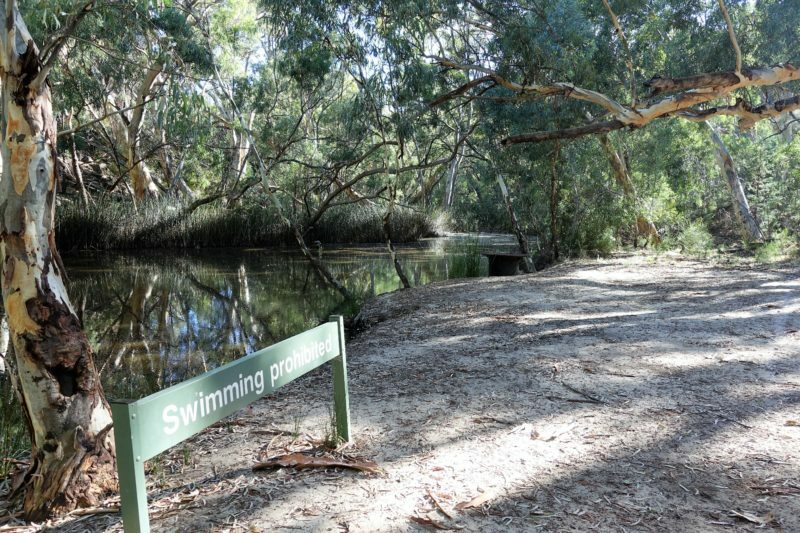 Ponds with signs saying no swimming always give me the shivers – you don’t know what’s in there. The scenery is beautiful, I especially love the colours of the rocks and the view, even if it wasn’t gorgeous enough to tear your friends away from their phones! Hahaha….it was kinda funny to see them looking at their phones, but I guess that is going to happen when they got reception for the first time in hours and who knew when they would get it again! I was not so lucky – I am with a different phone company and didn’t get reception! Sounds like a fantastic hike. I didn’t do nearly as much hiking as I’d like to when I lived in Australia, quite bummed by that! I glad you mentioned about people getting lost due to the lack of knowledge/preparation. I’m from Norway and we always hear stories about people needing rescuing because they aren’t prepared. Oh no, at least your mates enjoyed the views while it lasted. I’ll admit, I’m guilty of that too – getting distracted by my phone when I get reception. I can imagine sitting on the Wangara Lookout route waiting for animals and birds to photograph. 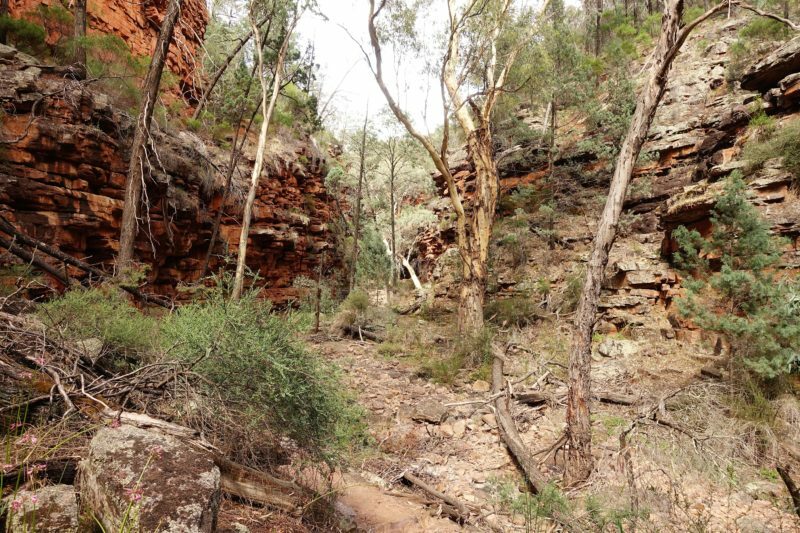 The Alligator Gorge Ring Route looked a little more beautiful, it’s good that you had it to yourselves! You posted some really beautiful pics of these routes too. Thank you. It’s a beautiful part of the world so fairly easy to do it justice. The mountain scenery and rock formations are amazing! 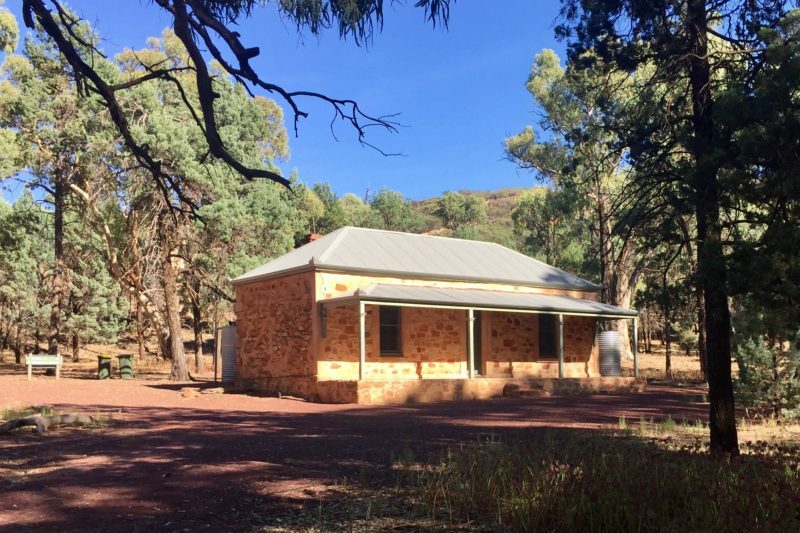 We would surely love spending a couple of weeks hiking, climbing, and adventuring in Flinders Ranges. Thanks Sheila. It’s a beautiful part of the country.